By this time of year you’ll likely be ending your strength phase and have some good endurance miles in your legs. If you are a time crunched cyclist living in a snowy area, rollers and high intensity intervals are the best option. Remember that high volume of low to moderate-intensity training sessions, only works when you can accumulate significant weekly hours at those intensities. 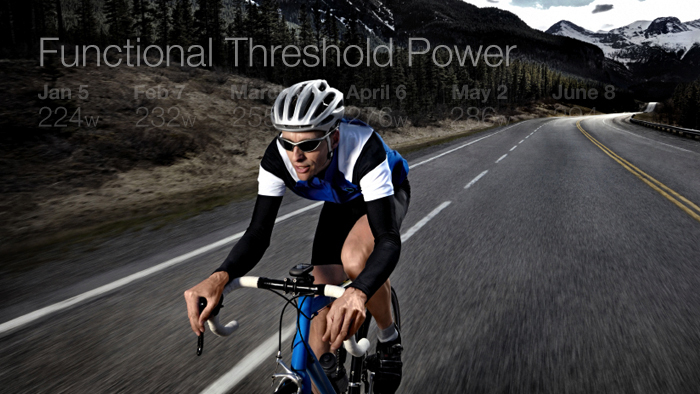 If you want to get to the next level this season now is the time for a good Functional Threshold Power (FTP) training block. Raising your FTP will save you a lot of energy during crits or let you drop your teammates climbing in your group rides. Increase the duration of your weekend group rides. You need to go over 4 hours to really stress your cardiovascular and muscular system. Try to climb as much as you can near your threshold on Saturday and arrive home with that “heavy legs” feeling after a hard day of climbing. On Sunday you should be tired but able to ride just under your threshold (88-93% of your FTP) also referred to as the “sweet-spot”. During the week you should do 3 days of solid FTP intervals (91-105% of your FTP). Start doing 40 to 60 minute each day and raise gradually to 60 to 90 minute. Try to get the 90 minute threshold workout on Saturday during your group ride and really go deep. Try to be rested between sessions in order to maximize the benefits of FTP work. Remember that you need to reach 91-105% of your FTP, so an easy endurance ride between sessions will allow you to recover. Saturday should be your breakthrough workout, but if you feel tired just maintain those watts at least 88% of your FTP. Focus on your threshold training for at least 10 weeks (rest week in week 4) and you will see a big difference. Improving your FTP means that you can go faster without going above your threshold. Maybe you won´t be a better sprinter, but you´ll no longer need to make those jumps to stay on the pack or struggle to not get dropped in the hills. You will also save a lot of energy and matches in your races, leaving you primed for the sprint or a solo effort to win. Start with a 10 minute warm up at your endurance zone with some 1 minute fast cadence efforts (above 110rpm). This will help your ability to contract your muscles faster and be ready for the main part of the session. Do 3×10 minute intervals at 91-95% of your FTP and recover for 5 minutes between each interval with an easy spin. If you are riding outside, hammer the final 400 meters to really exhaust your VO2max system. End your ride with 30 minutes at your endurance zone and keep your cadence high. During the last week before the recovery week, do 4×10 minute intervals to get 40 minutes of FTP work. Start with your warm up at endurance pace and some fast pedaling efforts. Then do 3 x 15 minute FTP intervals with 8 minute recovery between. These are a little harder than the 10 minute intervals, but you will accumulate 45 minutes of solid FTP work with this session. Try to make this workout on Wednesday or Thursday and make Friday a day off to be ready for your Saturday hilly group ride. This could be a good Saturday group ride so try to go over 4 hours. You can do the 20 minute intervals on the hills during the ride. Make the downhill your recovery and work on those handling skills! Do first the 20 minute interval just at your FTP and try to maintain a steady output. Between hills it´s important to set the pace at your tempo zone to keep working on your anaerobic threshold. Once you’re done with your 20 minute intervals make the rest of the hills at “sweet spot” (88-93% of your FTP), if you feel tired stay high in your tempo zone. The late base period is about building your engine and raising your FTP. Use these three sessions to go hard and you´ll see the difference in the next season!